edit/update June 2010: SH!OK is now closed. That was a short run, eh. SHIOK is the Malaysian or Singapore slang to express pleasure, such as "great", "tasty" or "cool." e.g. "Wah, this hokkien mee is damn shiok!" SAMBAL is a spicy chili based sauce popular in Singapore, Malaysia, Philippines and Indonesia. Used as a condiment or for cooking in stir fry dishes. Excellent with kangkong (river spinach), sting ray, eggs, squid and fried noodles. There are different variations of sambals depending on the usage. I was particularly interested when I first heard about SH!OK a few months ago. As many of you know, I have a certain soft spot for Singaporeans and an even softer spot for their cuisine. Despite Hong Kong's close proximity to Singapore, I can still count the number of Singapore restaurants on less than two hands. Even then, most of them consider themselves Malay cuisine or are South East Asian themed restaurants with a very broad and general menu. Among these scarce choices, absolutely zero of them have stood up to the authentic Singaporean standard. 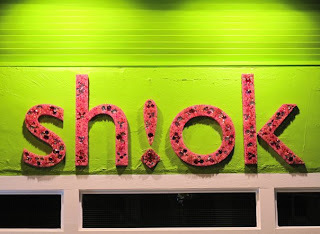 I soon found out about SH!OK on Peel Street, opened by the same owners of Bar of Soup on Staunton Street (now closed). I remember when I first found the newly opened Bar of Soup two years ago. In the quiet empty white restaurant, I heard the owners speaking to one another and I couldn't help but immediately pick up on the familiar distinctive accent. It turned out owner and cook, David Yip had set up fresh from Singapore, stirring up healthy soups without the use of MSG and minimal use of sodium. David Yip, the chef with Indonesian Chinese and Singaporean roots, brought the same healthy standard to SH!OK. Eager to see if Hong Kong finally had a decent Singaporean joint all its own, I squeezed SH!OK into my eating schedule asap. The lime green exteriors and bright pink signage of SH!OK are more reminiscent of a tacky teenage accessories shop than a restaurant. Upon entering, it was apparent that they didn't relax on the interior either. It suddenly felt like Easter with all the bright pastels on the walls, furniture and cutlery. That's certainly one way to catch attention on the otherwise quiet corner of Peel Street! Inexplicably, I didn't really mind the bright colors at all. "wahbiang! What kind of prices are these?" What surprised me even more than the bright green walls was the menu. It provided almost every popular Singaporean, Peranakan and Teochew dish. I grew wary... Even in Singapore, there are rare (if any) spots that try to cover everything from A-Z. Most Singaporean food stalls or restaurants specialize in just a few select dishes and focus on doing those dishes as best they can. In tow with me on my March 6th dinner visit was my Singaporean pal, Trina. While we both have sinfully enormous appetites, there was no way we could cover even 1/10 of the menu fairly. Not to mention that we were shaking our heads at the inflated prices compared to what were used to in Singapore (but this was later justified by the huge portions per order). Cons: The service needed a bit of work when I was there nearly 2 mths ago. It was as if our waiter had never served at all in his life before. He originally placed us at a tiny table in a tight corner when the restaurant was completely empty. Our waiter... and the other waiter he kept referring our questions to, were unable to answer basic questions without forming some telephone relay to the management somewhere in the back. To top it off, much of what we originally wanted on the menu wasn't available. Sadly, the separate daily rotating menu of some of my favorite items such as laksa, hokkien mee, prawn mee or even char kway teow weren't available at all (I'm a noodle fan, in case you haven't noticed); and we weren't in the mood to get messy with chili crab. But Trina and I, both deeply involved in the F&B industry world, were very forgiving and chalked it up to settling in new staff at a brand new restaurant in a foreign town. We narrowed our selections to three dishes: Sambal Okra, Chai Tow Kway and Mee Goreng. Brief look at these two dishes: The sambal okra was done well, though I personally could done with a bit more of the homemade sambal chili ontop! mmm! The mee goreng was tasty, but if I were to compare it to my favorites in Singapore and Malaysia, SH!OK's wouldn't stand a chance. Then again, there's absolutely no MSG... and to be frank, that bit of MSG does wonders at those little stalls down south (clearly, I'm not a health freak). The chai tow kway ended up being the highlight of our dinner. The fried radish cake came out in sweet & salty soft doughy bites and there was plenty of crisp fried onion to keep me happy. David Yip has his radishes stewed for hours then steams it for a bit more, followed by wok frying... resulting in a ultra tender cake. I was used to having my chai tow kway being a bit more crispy and hard around the edges at the local hawker stalls in Singapore, but I prefer it Mr. Yip's way! -- Despite being fried, SH!OK's chai tow kway was lighter and cleaner in taste than the usual heavily greased up variations in Singapore. Based on this small sampling alone, I'm glad there seems to be a decent Singaporean restaurant in Hong Kong now. I hope this builds momentum to the point where HKers will be confident in demanding many more and only the best of the best Singaporean cuisine. Hong Kong needs real Hainanese Chicken Rice yes? Try the chilli crab and let us know if it's worth the trip. I would like to volunteer myself and my embarrassingly large appetite for any food expeditions while I'm in Singapore next if you would so kindly join me? @Tabbie The more the merrier, right?! I would love to join for food expeditions. Let me know when you're back in town. @Avilia The menu looks quite pricey, but to be fair, the portions are HUGE. 2 people with a smaller appetite can share one dish and be set for the night to be honest.